Photos courtesy Blake Spurgeon The Top 10 teams of the Fishing League Worldwide competition, held on July 28, pose with their plaques. Reiley Pugh and Blake Spurgeon of Purdue Fort Wayne, bottom left in the blue, came in seventh place. 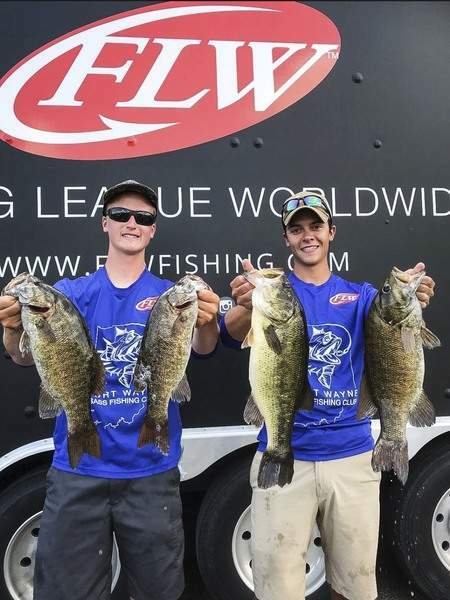 Reiley Pugh, left, and Blake Spurgeon, members of the Purdue Fort Wayne fishing team, hold up their bass after the July 28 Fishing League Worldwide Tournament. Their boat finished in seventh place. It was the Thursday before their Fishing League Worldwide tournament when Blake Spurgeon and Reiley Pugh went out to do some “pre-fishing” and explore the Mississippi River. The two Purdue Fort Wayne students would be competing against 81 other college teams in the July 28 competition. Although many of the other schools had well-known, large bass fishing teams, Spurgeon, 25, and Pugh, 20, were part of a 10-member group. They tried to not let that get to them as they lured bass. If they placed within the top 10 teams, they would qualify for the national championship. Spurgeon had already graduated from Ivy Tech, but he decided to go back to school to major in mechanical engineering and technology. He became aware of the Purdue Fort Wayne bass fishing team in 2016 and decided to join. Spurgeon's and Pugh's friendship sparked over tales of growing up fishing with their fathers and uncles. Even though Spurgeon didn't have a boat at the time, he invited Pugh to come check out the club. Eventually Pugh bought his own boat, and the two enrolled in the Fishing League Worldwide tournament happening in Minnesota along the Mississippi River. Prior to testing the waters that Thursday, they had done some research and picked out different baits for the fish, Pugh said. Spurgeon and Pugh had no problem finding both smallmouth and largemouth bass, and they felt prepared going into their Saturday competition. Waking up at 4:30 a.m. July 28, the two headed to registration to find their boat number. They were number 40. “That's a really bad number, because you want to be first in the pack or last in the pack,” Spurgeon said. Their boat number was directly related to their return time, which ended up being 2:30 in the afternoon. All 82 boats launched in order shortly after 6:30 a.m. and Spurgeon and Pugh were off to find the five largest bass possible. While they had success early in the week, it became a fight as the clock drew closer to their afternoon return time. “Throughout the day, we fought to catch fish. It was tough to get them to bite,” Spurgeon said. Toward the end of the day, things began to slow down, and while they had a few nice catches, it was clear they might only make it to the top 20 teams. That's when Spurgeon made their biggest catch: a largemouth bass weighing over 5 pounds. They rushed back to the weigh station to cull their fish. 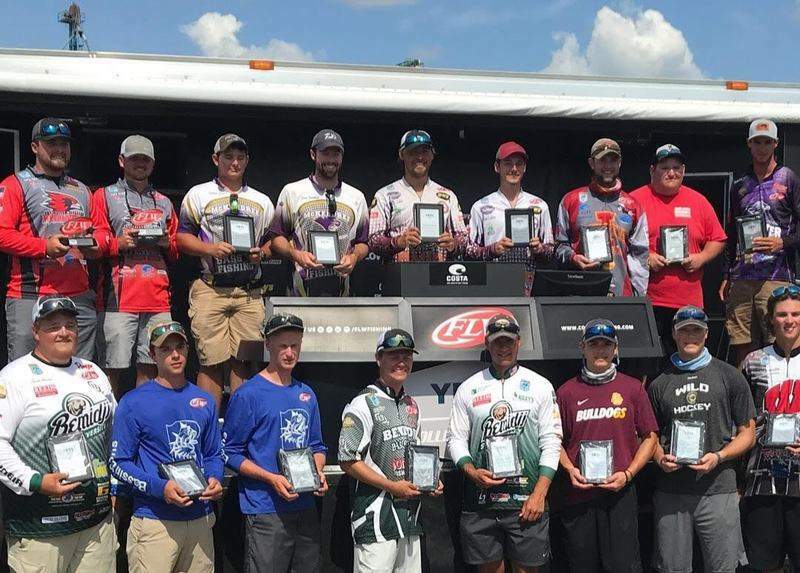 With the total weight of their five bass, Spurgeon and Pugh finished seventh and a spot the 2019 national championship, a first for the team. The Fishing League Worldwide National Championships will be held in the spring, with the location unannounced. At this competition, there will be around 150 boats for Spurgeon and Pugh to compete against. “Getting out there to fish, to catch some big ones and to have a chance to represent our school at a national championship, I think that's crazy,” Spurgeon said.